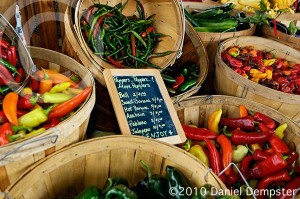 Farmers markets are a phenomenon. They continue to grow in number, sales volume, and length of season. They serve as an incubator for thousands of new businesses every year. 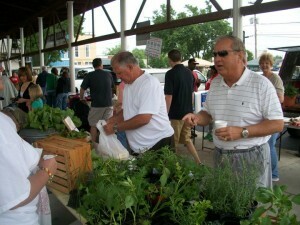 Farmers markets are much more than just a place to sell food. They have become important community institutions. They are a venue for socializing, where urban residents meet farmers and their neighbors. They have figured in the revitalization of downtown districts, bringing people into areas that were once vacant on Saturday mornings. In many cities, farmers markets are situated in low-income neighborhoods where there are no supermarkets, so they provide an important source of food security to the people who live in those neighborhoods. They serve an educational function, too, helping people learn to eat better . Kenny and I both take great pride in being a part of this phenomenon. We enjoy what we do and the friendships we have aquired since joining the New Albany Farmer’s Market. I emailed you, but thought I should write here, too! Would love some peaches on Saturday. $10 worth! Let me know if I can get them.